A hereditary monarchy, Qatar is ruled by the House of Thani. The country lies on a peninsula in the Persian Golf and shares a short border with Saudi Arabia. 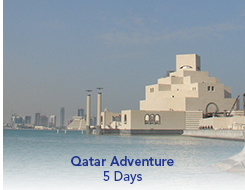 This tour renders a comprehensive overview of modern Qatar. With its high income economy the country offers the discerning traveler a wide range of services from city experiences to desert adventures and beach relaxation.